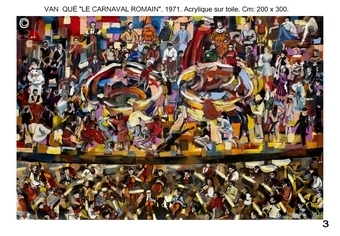 The genesis of the work of Van Que "ROMAN CARNIVAL" - 1971 - Acrylic on canvas - Cm: 200 x 300. 1968-Toulouse Capitole Theatre: Creating "BENVENUTO CELLINI" an opera by Hector Berlioz, by Michel Plasson, (The Master was 37). "The ROMAN CARNIVAL" is the main draw of this opera. Van Que was 30 years old and was a guitarist (he was still studying classical guitar at the Conservatory of Toulouse). Chosen by his master Marc FRANCERIES they were both accompanying the choirs of the opera. This support lasts only a few minutes. Van Que leaves the stage and takes the place of the audience to take the role of the painter. He studied to compose a great picture of CARNAVAL ROMAIN. Some months later, this artwork is made in 10 days (2 hours every morning before leaving for work in CNRS-ENSEETH). The artwork measuring 2 x 3 meters. The distribution is very dense (there is one hundred and twenty six characters), because it brought together different scenes, different times, including the passage on stage of technicians and staff of the opera. This work can be split into multiple pictures that are sufficient by themselves: for example the orchestra pit, which may itself be divided into different artworks, exemple: the conductor Michel Plasson Master and 2 cellists .. .
Van Que leaves the stage and takes the place of the audience to take the role of the painter. He studied to compose a great picture of CARNAVAL ROMAIN. Some months later, this table is made in 10 days (2 hours every morning before leaving for work in ENSEETH). Table measuring 2 x 3 meters. The distribution is very dense (it one hundred and twenty six characters), because it brought together different scenes, different times, including the passage on stage technicians and staff of the opera. This work can be split into multiple tables that are sufficient by themselves: for example the orchestra pit, which may itself be divided into different tables, eg the conductor Michel Plasson Master and 2 cellists .. .